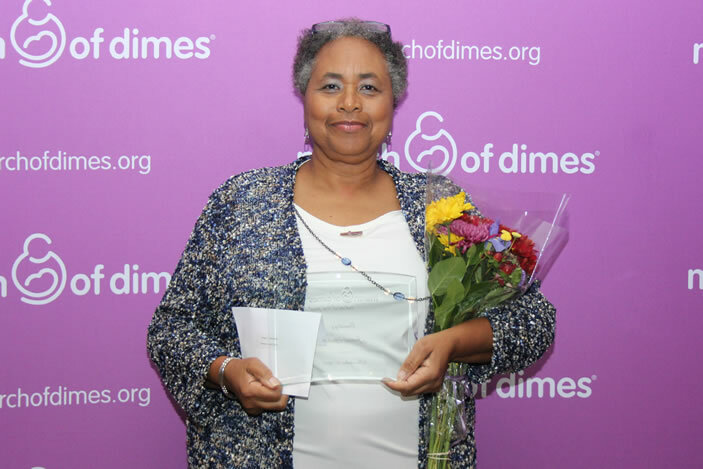 The Georgia Chapter of the March of Dimes has recognized three Emory Healthcare nurses with 2015 Nurse of the Year Awards. Janese Gaddis, RN, MSN, OCN from Emory University Hospital Midtown, Kathy (Katie) Oldham, RN, MN, from Emory University Hospital and Christine Wollenhaup, MS, BA, RNC-OB, from Emory Johns Creek Hospital were three of 15 nurses honored as outstanding local nurses during the November awards ceremony. 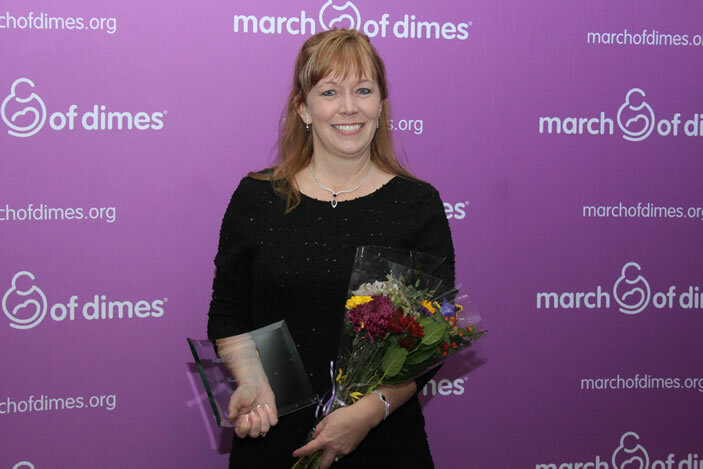 Through Nurse of the Year Awards, the March of Dimes recognizes nurses who demonstrate exceptional patient care, compassion and service. The nurses recognized this year have played a critical role in improving the health of Georgia’s residents. Janese Gaddis, RN, MSN, OCN (Category: Oncology) – nurse educator on the medical oncology unit (Unit 71) at Emory University Hospital Midtown. Janese has been a nurse for 48 years and has been at Emory University Hospital Midtown for seven of those years. While at Emory, she has been instrumental in promoting patient safety and decreasing revenue loss for the hospital. She implemented the use of a chemotherapy checklist, which prompts the nurse to ensure that treatment criteria and toxicities are addressed prior to submitting the orders to the pharmacy. This checklist is also used as a teaching tool for nurses who are new to chemotherapy administration. Kathy (Katie) Oldham, RN, MN (Category: General Medicine) – unit director for gynecology and general surgery at Emory University Hospital. Oldham has made a tremendous impact as a nurse with 30 years of experience and dedication to the field. Since 2011, her unit has sustained the highest nurse satisfaction scores among all other units within the hospital. Christine Wollenhaup, MS, BA, RNC-OB (Category: Women’s Health) - director of Women’s Services, Emory Johns Creek Hospital. Wollenhaup has been a nurse in Women’s Services for over 17 years and is committed to making a contribution to reducing the maternal mortality rate in Georgia, which is one of the highest in the country. On her unit, she provides dynamic learning experiences for staff through online courses and assists them in implementing best practice procedures. She is a Doctor of Nursing Practice candidate at Duke University and is completing her Capstone project on improving bedside shift report on the postpartum unit. "We are proud of our nurses, who are committed each and every day to giving exceptional care and service to our patients and their family members," says June Connor, RN, interim chief nursing executive for Emory Healthcare. "This honor is well deserved for these three nurses, who also share their talents through leadership and teaching roles on their units." Nurse of the Year Awards are given annually in approximately 15 award categories. This year, more than 760 nurses were nominated in Georgia, and of those, 210 were selected as finalists. Emory Healthcare and Emory School of Nursing combined had more than 30 finalists this year. 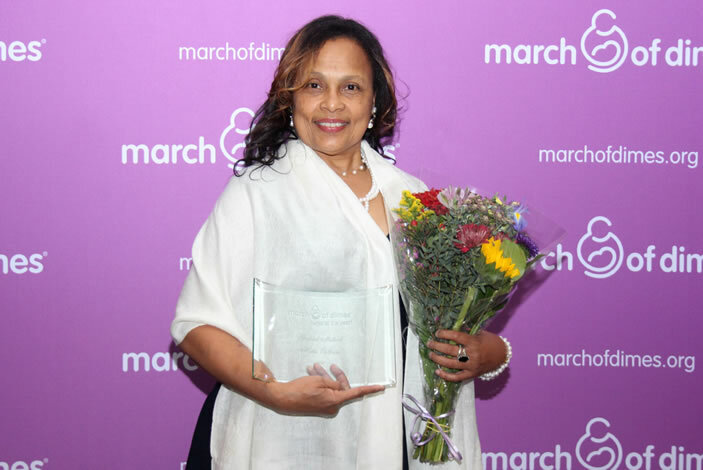 The March of Dimes is the leading nonprofit organization for pregnancy and baby health. For more than 75 years, moms and babies have benefited from March of Dimes research, education, vaccines, and breakthroughs. With chapters nationwide, the March of Dimes works to improve the health of babies by preventing birth defects, premature birth and infant mortality. Emory Healthcare, with almost 16,000 employees, is the most comprehensive health system in Georgia. In fiscal year 2014, Emory Healthcare had $2.6 billion in annual net revenue and provided $85.3 million in charity care. System-wide, it has 1,870 licensed patient beds. Emory Healthcare is the only health system in Georgia with two Magnet-designated hospitals, Emory Saint Joseph’s Hospital and Emory University Hospital, for nursing excellence. Emory Healthcare's core purpose: "To serve humanity by improving health through integration of education, discovery and health care."